Members of OSPD took first place in the pipe band competition at the Scottish Festival held in Tulsa, OK! We had a lot of competition from some very fine pipe bands in the region but we managed to pull out a win. Additionally, our very own Bryan Crable swept the grade II solo competition. Congratulations, Bryan! 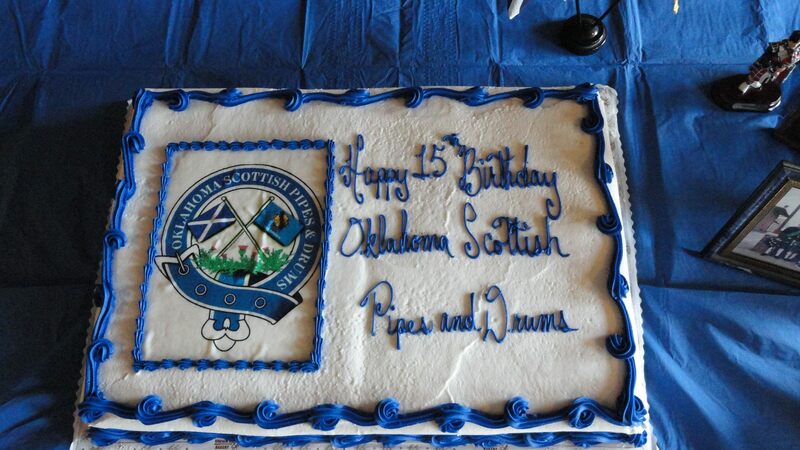 Back in August we celebrated our 15th birthday as a band. Only two members remain from the original group (Paul Sinclair and Benny Hughes). Through the years we have added many new members to our band family, each one offering their own unique gifts to the group. We are a varied bunch, a crazy crew from all walks of life. Yet somehow we make it work and have a heck of a good time along the way. If you were able to join us for our celebration, thanks for sticking with us. If you weren’t able to make it, consider this your invitation to the party for our 20th birthday! Sláinte! Law enforcement is keeping us busy…in a good way! We are proud supporters of our law enforcement brothers and sisters. This summer we have had the opportunity to show that support by playing at many law enforcement functions. 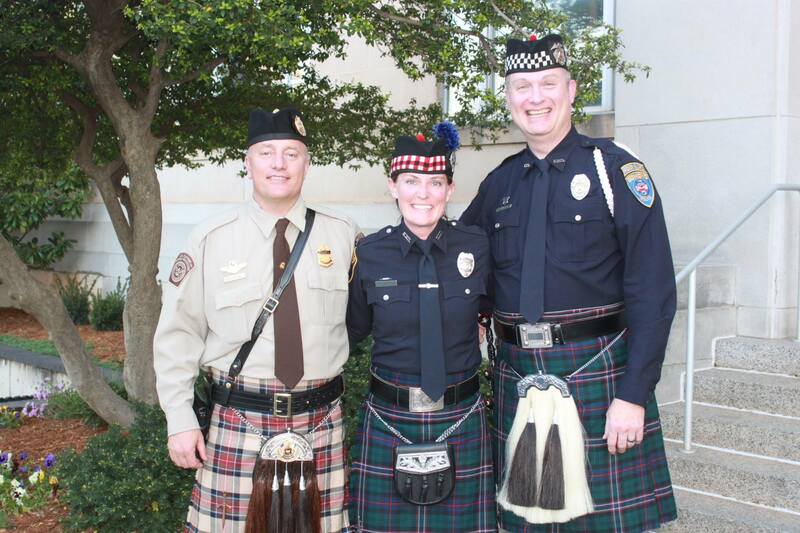 In July, we welcomed the newest officers to the Norman Police Department at their graduation ceremony. 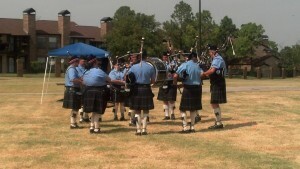 We also played at the The Benchmark Cities Police Chiefs Summit in OKC. Some of our members are in local and federal law enforcement so they showed up in their Honor Guard uniform. 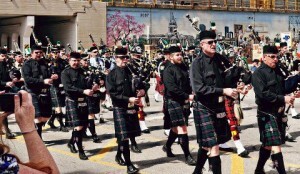 Spring time is our busiest time of year, with festivals, graduations, and St. Patty’s Day fun. 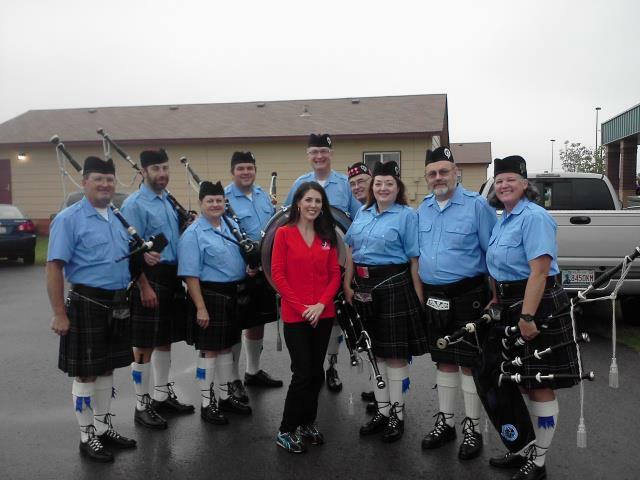 OSPD debuted new members and some new uniforms and had a fantastic time! 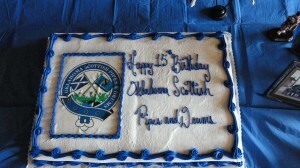 We started off the piping season with a charity event for Bob Stoops. Sorry no pictures allowed. As always, it was a good time and for a good cause and we are happy to do it each year. We did our St. Patty’s Day “warm up” gig at Live on the Plaza. The weather was on the windy side, but warm enough, and it was a chance to show off our new uniforms – all black. Oh, we looked good. 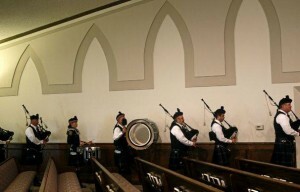 After another charity gig, we got ready for any bagpipe bands’ dream holiday – St. Patrick’s Day. We played many gigs that day, from playing for our military friends at Tinker AFB to the OKC parade. We again ‘blacked out’ the band – the new uniforms were a hit. The rest of the day was spent playing and throwing back some pints at a few local pubs….many pictures, few that can be shown publicly. 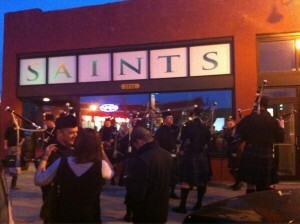 No one needs to see what a bunch of pipers look like at the end of pub crawling on St. Patty’s Day! 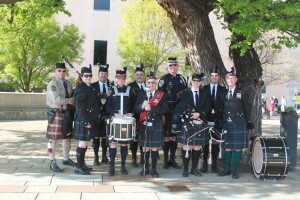 One of our most memorable performances was playing at the OKC Memorial Day of Remembrance ceremony on April 19. It was indeed an honor. We have become regulars at the 89er Day Parade and Iron Thistle Scottish Festival. 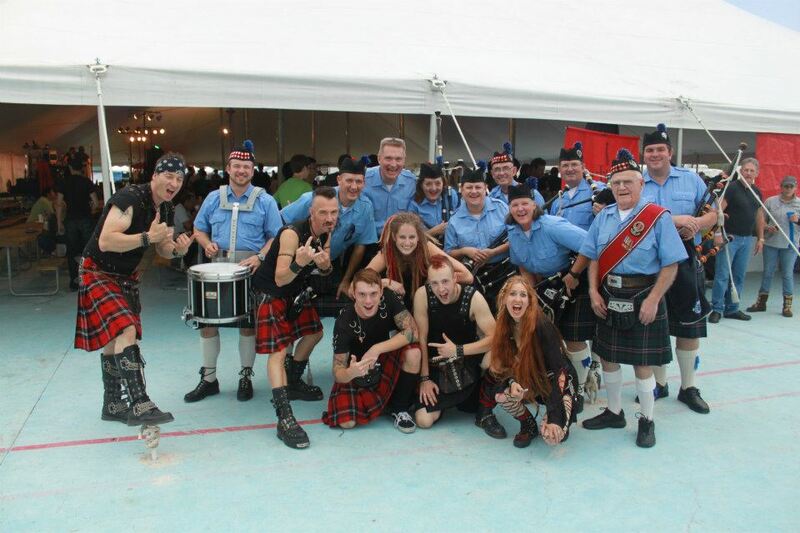 At Iron Thistle we continue to be a real crowd pleaser year after year – the largest and finest pipe band at the event. This picture ran in The Oklahoman newspaper. We continue to be proud supporters of our local law enforcement. 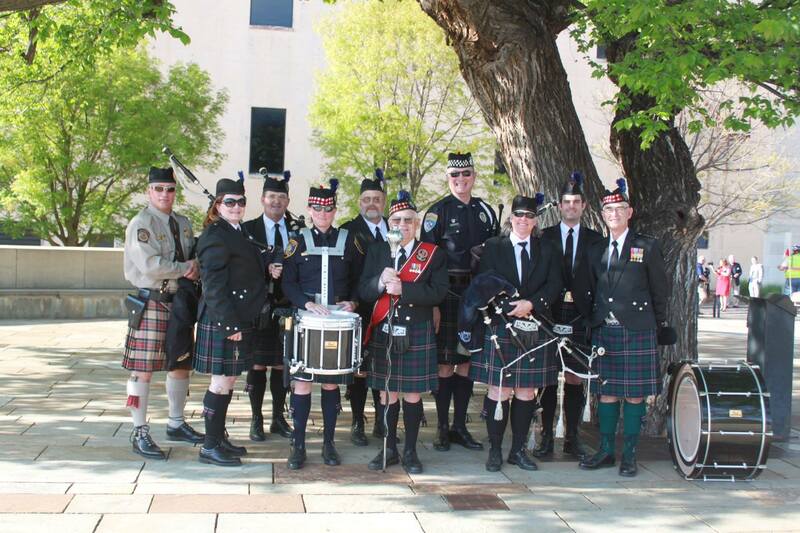 Many members provided solo performances for local police departments during Police Week as well as an OSPD mini-band providing a performance for the Benchmark Police Chief’s Summit in OKC in May. Our final sheduled performances for the spring season were three different graduation ceremonies for the University of Oklahoma. A tiring day, but we are always willing to play for our friends at OU! 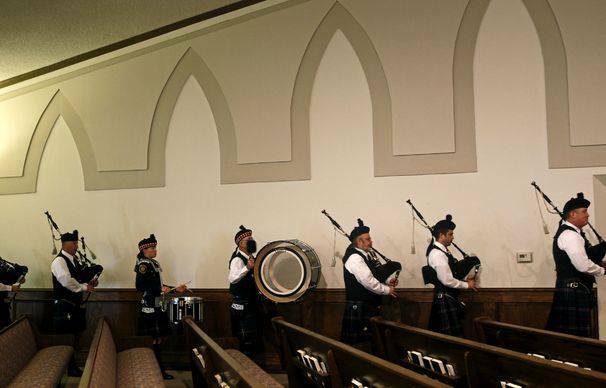 We’ll spend the summer taking some much needed personal time off, learning some new tunes, and maybe getting ready for some piping competitions in the fall! Below is a biography of Benny Hughes, excerpts of which were read aloud at the Scottish festival in Tulsa, where Benny was named the Honorary Chieftain for 2012. The biography is written by Keith Roberson, long time friend of Benny and our band’s Co-Pipe Sergeant. “Bernard (Benny) Hughes was born April 29, 1926 on the Isle of Butte in Scotland, in a small farm cottage near the fishing port of Rothsay. He spent his formative years there, until his father, Patrick Hughes, moved the family to the eastern side of the Scottish mainland looking for a better life for his family. After his father’s death, Benny often stayed home from school to care for his mother as her health failed. In 1943, at the age of 17, he was drafted into the British Army. After basic training in Aberdeen, he joined the 6th Battalion of the Gordon Highlanders, Infantry Unit. His unit did advanced combat training in England and was then sent to Normandy, where the Battalion landed approximately 10 days after D-day. Benny and the Gordon Highlanders joined the Allied Forces and saw combat as they marched across portions of northern France and then into Germany. Benny earned four combat medals during his time in the Gordon Highlanders, which he still proudly wears on his Scottish Pipe band uniform. He earned the 1939-1945 Defense Medal, the 1939-1945 Star, the France and Germany Star, and the End of the War Medal. He spent some time in Germany after the war in the Allied Forces peace keeping effort. After that time, the Gordon Highlanders were sent to northern Africa for desert combat training, spending two years in the treacherous area around Tripoli. In 1947, Benny married the love of his life, Ina Taylor. One month later, he accepted his discharge from the Army. Benny held numerous jobs in Scotland over the years. In 1957 after his two sons, Benny and Tommy, were born he moved the family to Canada looking for a better life. Less than a year later, they moved to Oklahoma and made a life and home for themselves. Benny, Ina, and their sons worked hard to integrate themselves into American life, and became naturalized citizens. 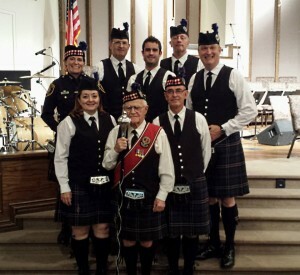 Benny’s love for his homeland and culture took root in Oklahoma soil and he became the Drum Major for the Highlanders of Oklahoma City in its early years. In addition to his service with the Pipe band, he and Ina taught Scottish Country and Folk dancing for several years. 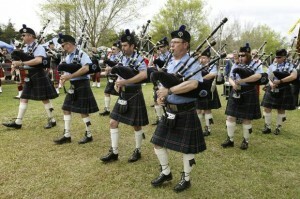 Benny has appeared on several local TV News broadcasts, over the years, in interviews regarding his Scottish Heritage. He has done vocal performances of “Scotland the Brave” and other Celtic folk tunes for the viewing audiences. In the 1970’s Benny was asked to become one of the state’s first Certified Soccer referees. He did so, and helped Soccer gain solid footing in Oklahoma. He even refereed in an exhibition game in Tulsa in which the all-time great soccer player Pele participated. 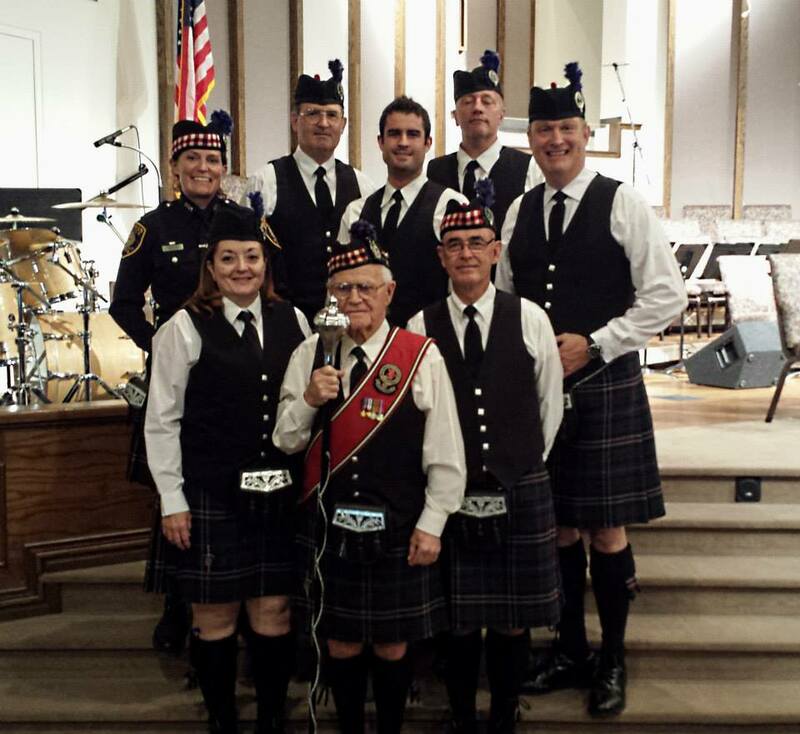 After more than 40 years with the Highlanders of Oklahoma City, Benny helped to form a new Pipe band. 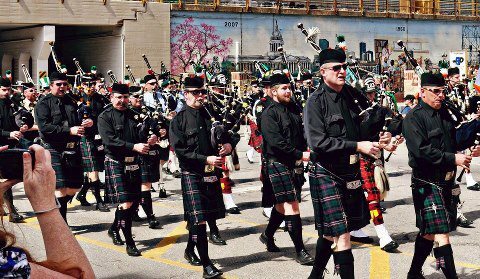 The Oklahoma Scottish Pipes and Drums was formed in 1998, and now has numerous competition wins, as well as other medals and trophies. There is nothing Benny enjoys more than spending time with his band “family”, and helping the band to sharpen its marching, musical performance, and competition skills. Anyone who has ever met Benny has been impressed with his unforgettable and likeable personality and kind ways. He treats everyone with a special respect and dignity. Everywhere he goes, people are quick to recognize and greet him, even when they have not seen each other for many years. 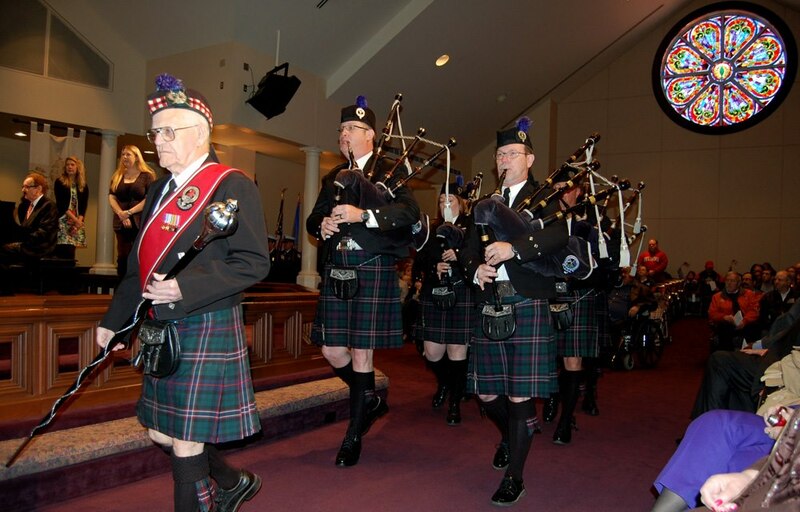 We honor you, Benny Hughes, for your service to the Scottish community, to the State of Oklahoma, and for your dedication to the American ideals of freedom, hard work, great friendships, and solid family values. 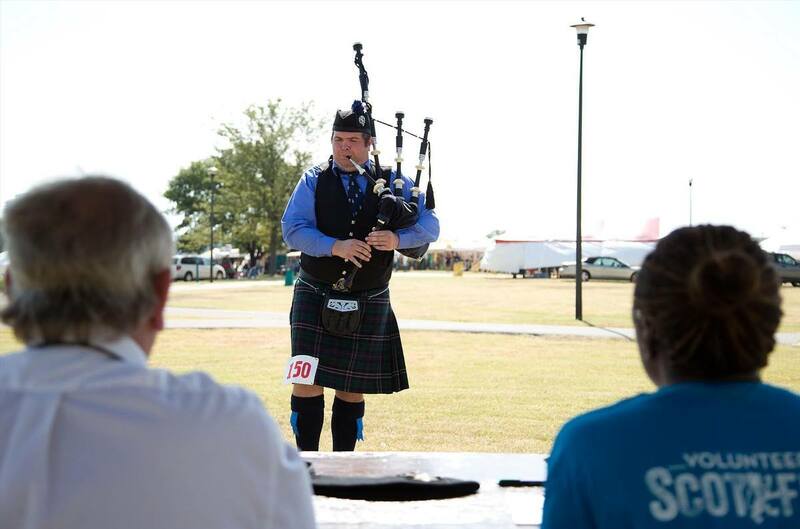 We had a great time at the OK Scotfest in Tulsa this past weekend. Our band is proud to have as a founding member Mr. Benny Hughes, our Drum Major. Benny was honored at the Scotfest as the Honorary Chieftain for 2012. Our band was the largest in attendance. We played various sets around the festival on Saturday and Sunday. On Saturday night we had the unique opportunity to play with Celtica, a piping rock band that headlined the festival.